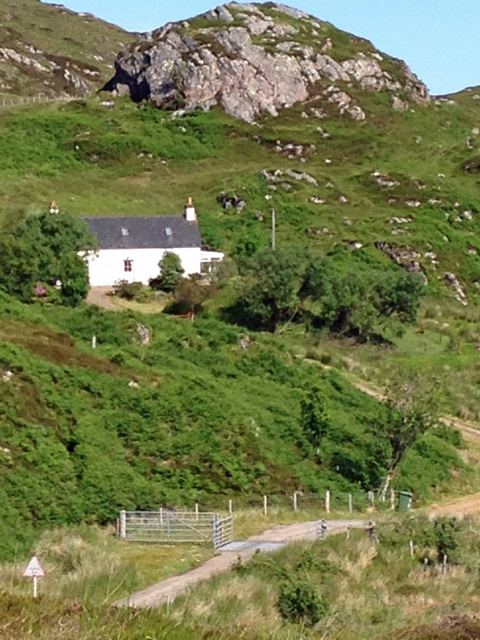 Hill Cottage, Fanagmore, near Scourie, is a traditional stone built self catering cottage set in a stunning location overlooking Loch Laxford on the North west coast of Scotland, approximately 90 miles north of Inverness. This part of Western Scotland is a remote area of outstanding natural beauty, with island-studded bays, gleaming sandy beaches and towering cliffs. Irrespective of what you expect from a holiday here you cannot fail to be awestruck by the beauty of this place. It is an ideal location from which to explore the local area or as a centre to tour the North and West of Scotland. Handa Island itself has spectacular cliffs where you will see large numbers of puffins and other seabird colonies especially during the breeding season. From Scourie harbour you can take a trip around Handa Island by boat. (departures are usually every 2 hours during the tourist season). To explore the island you can take a boat from Tarbet which will drop you on the island where you will be met by a member of the Scottish Wildlife Trust, who will tell you what you can see and where. The path around the island is about 6 km. Despite this being the next best thing to wilderness, a place where you can almost feel you are alone on this beautiful planet, there is a seafood restaurant (seasonal) just a mile from the cottage at Tarbet. The nearest bar and shop is at Scourie 6 miles away. The main nearby shopping and touring centres are Ullapool and Lairg. Lounge has TV for video and DVDs only - no reception. DVD player, Video and selection of videos and DVDs. Limited WiFi access by satellite, please note this is for basic 'keeping in touch' and is unsuitable for games/streaming, and anyone looking to work whilst on holiday, excess downloads will be charged for. Kitchen/dining - leading to conservatory, electric hob, oven and grill, microwave, fridge, freezer, washing machine, tumble dryer. 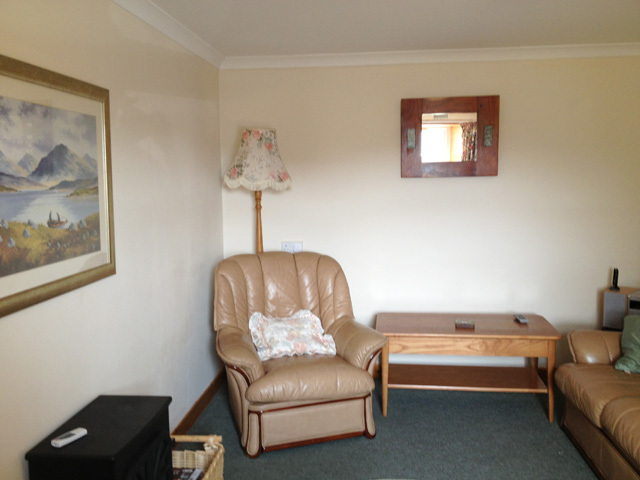 Conservatory with views of the mountains and sea loch. Bathroom with an electric shower. Outside facilities to store walking boots etc and drying area. Sorry but we are unable to supply a cot or high chair. One pet is allowed at the property. The water to the cottage is treated, however you may prefer to drink bottled water. Due to the location mobile coverage may be limited or even unavailable. We have been advised that the Vodaphone network does provide coverage, however the reception can be variable. Expansive and deserted sandy beaches nearby that stretch for miles, including the haunted Sandwood Bay, graveyard of many ships wrecked off Cape Wrath. Great week at Hill Cottage. A chilled out getaway from it all. Miles from anywhere. Lovely scenery. Cottage is well stocked with everything you need for a peaceful break. Conservatory is lovely and every morning sat in there listening to radio 2 watching the sunrise, sheep coming down from the hills and fishing boats going out. Only downside is shower. Small and temperamental. Don't see point in having limited wifi... would rather there not be any. We went as a couple and it brought us even closer together. No life distractions. Wish we could live there full time. Amazing place. This place is stunning. Cosy wee cottage surrounded by stunning scenery. Lots to do in this part of the world, or just kick back and relax in the cottage's conservatory and let the hours drift by. Loved it! 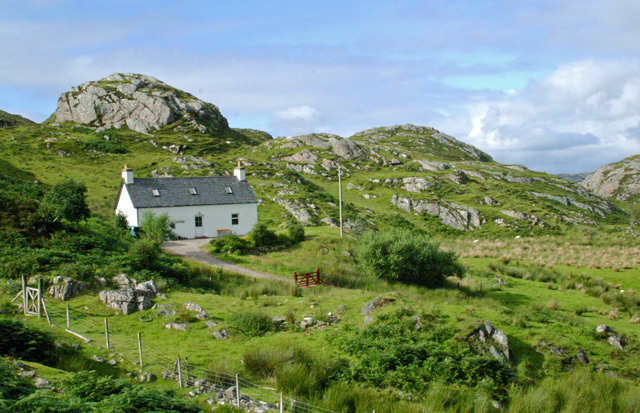 Hill Cottage is perfect if you crave isolation, utter peace and quiet, rugged scenery and nil light pollution. It's not so good if you are a TV addict and/or you cannot survive without your mobile phone. Administrative aspects faultless. Spectacular and stunning location for a holiday cottage, although for the first five minutes of arriving at Hill Cottage I must have said "Wow" about thirty times. The panoramic view over Loch Laxford and the surrounding mountains was magnificent. 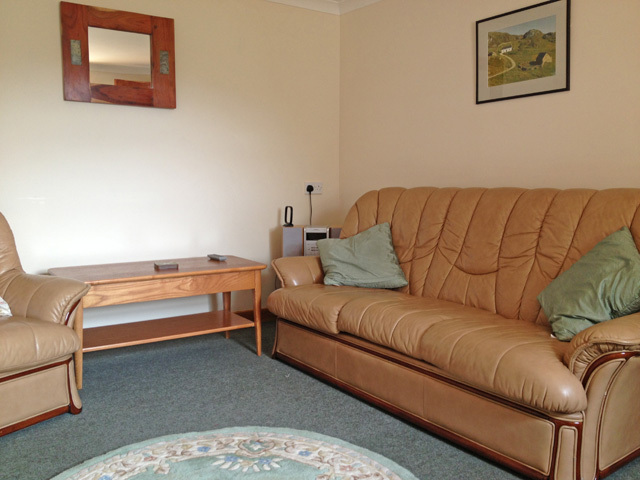 The cottage is cosy and well equipped, with a large, fenced garden surrounding it. We lost count of the different bird species we saw. We were lucky and had warm sun for a week which always helps. 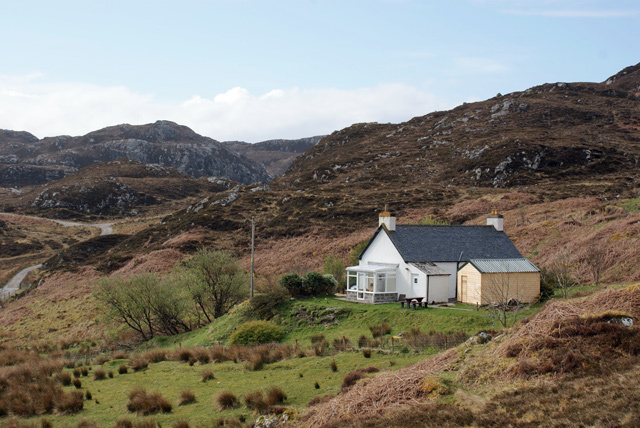 A brilliant place with no neighbours so if you have been searching for isolated or remote cottages on the net, then Hill Cottage fits the bill perfectly. We will definitely return. We had a very relaxing time at hill cottage the piece and quiet and wild life was fantastic , we were there two weeks but wanted to stay three , but sadly it wasn't available, it's easy to lose your self in every day work and life hill cottage helped us to find our selves again we both said it was the best holiday we had ever had and we would go back if we could , we would recommend hill cottage to anyone who has lost them selves in life and work but go for two weeks to truly unwind and enjoy it it's worth it . Lovely cottage and fabulous location. Peace and tranquility are amazing. Everything you need is here and the recently added conservatory was a brilliant idea. Wonderful sea views from beyond the hill which faces the conservatory, (where there is also a strong mobile signal) just make sure you wear walking boots even though it's only 5mins away. Lovely place to come with good company, but it would be truly incredible to come alone. October 2015. Hill cottage was very well appointed, it had everything you could wish for in a wilderness cottage, a well appointed kitchen with all the essentials required, a warm comfortable lounge and a nice bathroom and shower. The view from the conservatory over the loch to the mountains beyond was wonderful. After a long day hiking the washroom was great, a place to clean off boots and wash walking gear. If you like being in a peaceful and remote place this is one for you ! Ps If you need to stay in touch there is a GPRS Vodaphone signal in the conservatory. Very comfortable. Fabulous view from kitchen window. Peaceful. Everything we needed was provided. A memorable holiday in an indescribably amazing spot. Absolute silence. Best kitchen-window view ever. Incredible night sky - absolutely no light pollution whatsoever allows you to spend hours looking up at thousands of stars. Despite the remoteness, lots of local attractions, beautiful beaches and mountains/scenery to explore. Very cosy and warm cottage, easy to be nice and snug on a rainy day. Only downside was staying for one week instead of two - hope to be back again for longer! Having just spent a rather cloudy week at Hill Cottage, we realise how lucky we were to escape the heat wave!! 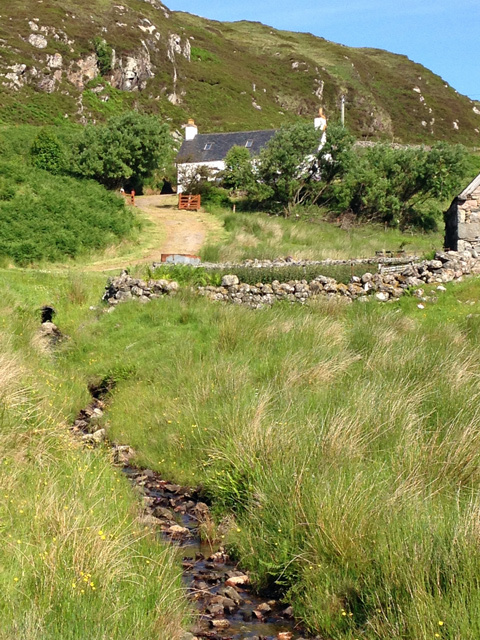 The cottage is tremendous, a splendid combination of remoteness and comfort. So many little touches have been thought of, anyone making a booking can be confident that the merits of Hill Cottage have not been overstated, and that enjoyment of the cottage and its surroundings begins on the first turn of the key. (thought - maybe not wise to be so effusive in case I want to book again!! Hill cottage in Fanagmore is the good choice for people who like secluded places, no noise, only bird songs and sheep bleeting, one could spend days looking at loch Laxford under changing lights from the cottage dining room . The property, a traditional cottage with a family history is very comfortable, within walking distance from Tarbet its restaurant and the ferry to Handa island. We enjoyed a great week there. We stayed in Hill Cottage in Fanagmore from 13/08/2011 to 20/08. It was a wonderfull stay. 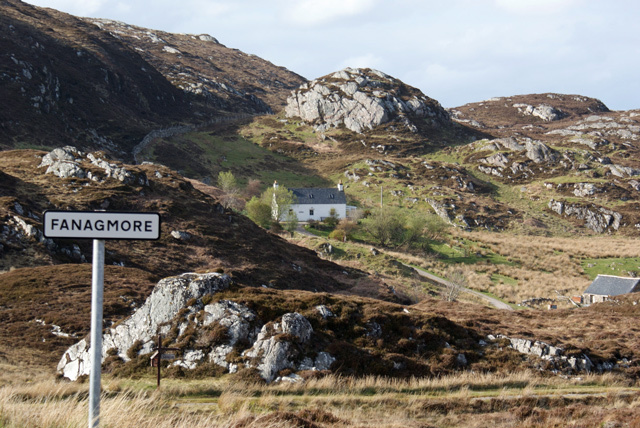 We already knew this area before and it's really one of the best places in West Sutherland. The cottage itself was very cosy with a wonderfull view. We were also very satisfied with the agency : Wilderness cottage. Everything has run smooth, no problem, always personal answer to our questions...and the impression that "somebody was here to help" not only a Call Center...Really a good choice too!!! 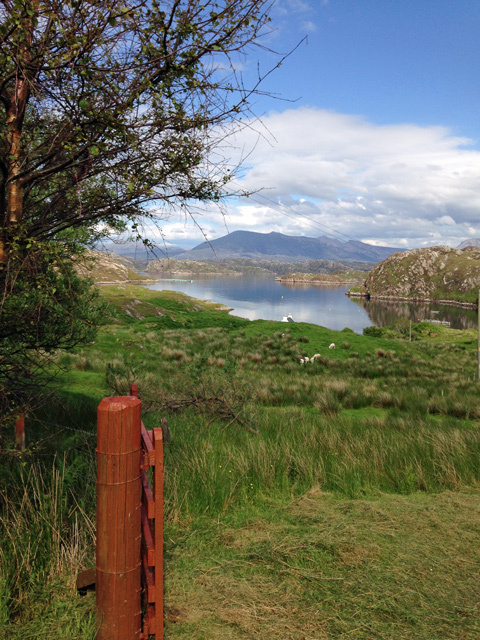 The view from the garden is stunning: straight across Loch Laxford to the whole ridge of Foinaven. The drinking water tastes lovely, and don't worry about petrol - the garage at Scourie functions 24 hours a day. No TV, no telephone, no mobile signal, no wifi, no neighbours, no traffic. What more could you ask for? We really don't want any more people to know about Hill Cottage because we would like to find a vacant week for a third visit. Sutherland is awesome. Dealings with Wilderness Cottages excellent. 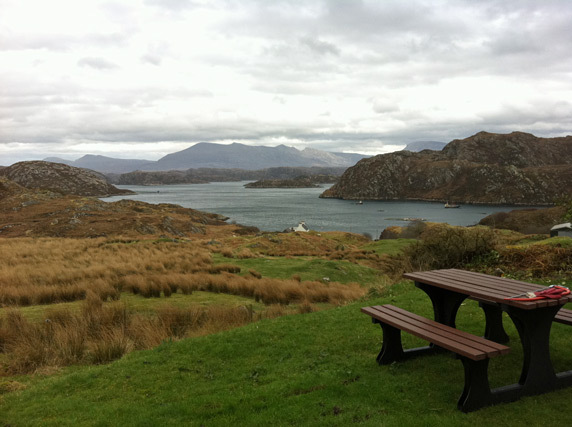 Hill Cottage is amazing, the most idyllic remote location with incredible views. The photos on the internet do not anywhere near do it justice. The cottage itself is very comfortable and cosy and just gorgeous. The whole place was much more than we were expecting. We are already planning our return. If you want to get away from it all, this is the place for you. The thing that strikes you most, apart from the marvellous view over mountain and sea, is the utter and complete silence, something that is almost impossible to find these days. We stayed in November, and because of the total lack of light pollution we could observe the night sky in its true glory. The cottage was clean and warm. Five Stars! Mike and I spent 2 wonderful weeks in September at Hill cottage and loved ever minute. the Cottage was everything we had read about and much more. The facilities were really up to standard .We especially like sitiing and spending hours just being mesmerized by the beautiful and ever changing views out of the large window.Hiking paths were plenty and near.If you go dont miss Sandman bay ,breath taking. like being on a huge deserted beach in the Carribean.WE would return again espcially for the peace of such an isolated spot. This is our second stay and was every bit as good as the first time. 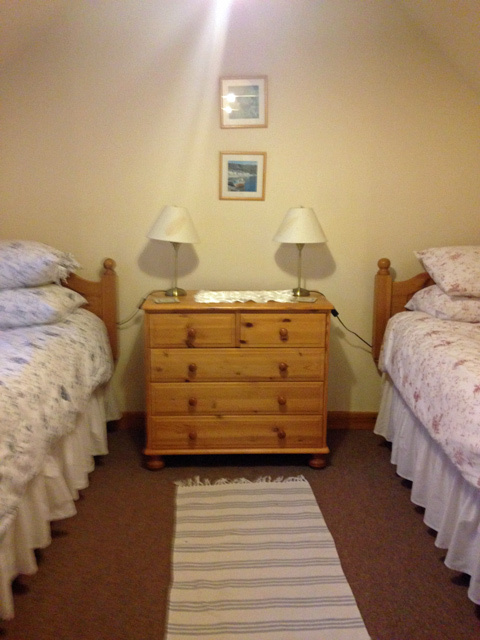 The cottage is comfortable and well appointed with great views of lochs and hills. 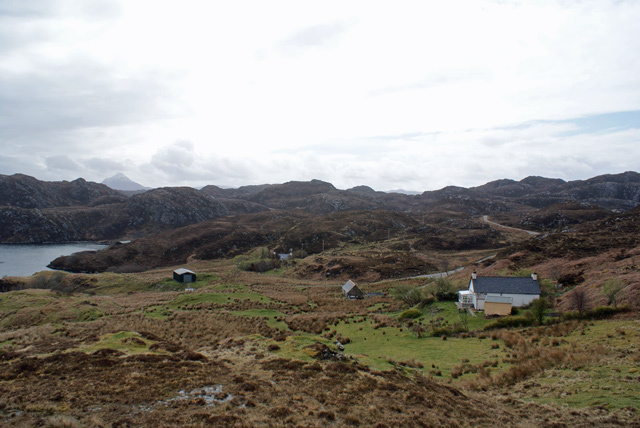 We werent short of things to do both in the immediate area and further afield to Lochinver and Durness. Helped by good weather most of the time. Again enjoyed eating at the Shore Restaurant at Tarbet after a day on Handa Island. 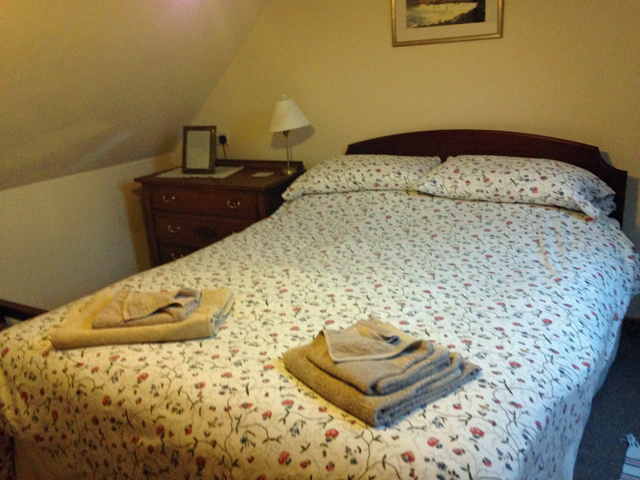 We found Hill Cottage exceptionally comfortable and well equipped. 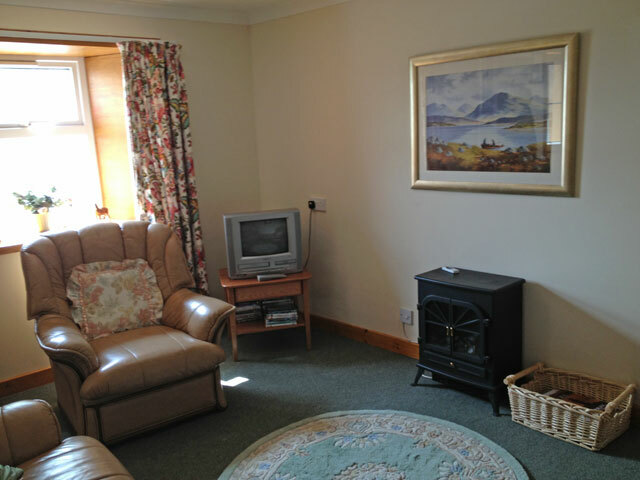 It is situated in a wonderful setting overlooking Laxford Loch with a backdrop of stunning mountain scenery. If you want to get away from it all, this is the cottage for you. An very well presented cottage- the classic crofters cottage but with all mod-cons and a twist- theres a window in the gable giving outstanding views over the surrounding sea and hills beyond. We had to fight for possession of the rocking chair by the window. The location of the cottage was perfect for exploring on foot and by car, and so quiet. We were lucky if we saw 2 or 3 cars a day. Even the sheep and resident geese in the field were welcoming. We slept like logs to be woken early by the sun streaming through the bedroom skylights. Great place- great weather. We would wholeheartedly recommend this as a complete getaway from the stresses of modern life. Our first time here and were enthralled. We wanted a get-away-from-it-all holiday and could not have wished for more. The scenery in this part of the world almost makes you weep with joy at its rugged beauty. Winding single track roads, brooding mountains and beautiful lochans set amongst some of the oldest rock formations on earth. The view from the dining kitchen window was unsurpassed. The opportunity to sunbathe on desereted beaches in an unusually sunny late April was an unexpected bonus. Memories of the view from the top of Stac Pollaidh in glorious April sunshine will last forever. We were reluctant to leave and will definitely return! We stayed at Hill Cottage in mid April. The weather was unusually mild for spring in Scotland, only rained on one day. The cottage was wonderful, really warm and cosy with everything in it you could possibly need. The location was amazing, peace and quiet was the understatement. The scenery and wildlife were awe-inspiring, some days we saw more deer than people!! Fantastic walks in the area, Faraid Head..Sandwood Bay...Scouriemore..Smoo Cave, to name but a few. On non-walking days we drove down the coast road to Ullapool, and round the entire North Coast. This area of Scotland has to be seen to be believed, it is totally amazing. Dont take our word for it, go and see!! We had a wonderful week staying in Hill Cottage despite a week full of weather of every description - sun, snow, hail, sleat, rain and very strong winds! The cottage was warm, cosy and very well equipped, providing us with a lovely refuge when we returned wet and wind-swept from walking in the spectacular countryside. The view from the cottage is absolutely awe-inspirig - over the week we were there, we watched the snowline descend on Foinaven, across Loch Laxford, and the waves crash against the rocks. We would really recommend: Sandwood Bay; the walk along the north bank of the River Laxford from Laxford Bridge; the Bone Caves at Inchnadamph; and exploring the area around the cottage and Tarbet. We found that the drive to Durness was more impressive than Durness itself but, to be fair, it was dreadful weather when we got there and nowhere was open! For anyone with even a passing interest, the geology of the area is fantastic. As geology graduates ourselves (many years ago now! ), we were really excited to dredge up those old familiar terms of Lewisian Gneiss, Laxfordian Schist, the Moine Thrust Zone and Scourie Dykes! We finally understood what they had been talking about at university and embarrassed the children with our enthusiasm! We would like to return at some point, but would choose to visit a little later in the season when the weather is likely to be less wild, and places have opened, i.e. Handa Island and the various restaurants. This cottage turned out to be exactly what we were looking for, a fantastic retreat. This part of Scotland in early february, was superb. If its peace and quiet, stunning scenery and wildlife youre after, you can hardly go wrong by choosing Hill Cottage. A week in Northwest Scotland in mid September? Hill Cottage was a great choice! Apart from the scenery, which is stunning and defies all superlatives, this is delightful, warm and fully equipped accomodation. Only a mile away at Tarbet, the Shore Line serves locally caught sea food that surpasses all your expectations (sadly now closed for the season)! The walking all over Sutherland is excellent! Dont come! You will hate it - leave it for those of us who really deserve it! Just back from Hill Cottage and we werent disappointed! The cottage was ideal and the setting was absolutely stunning; what else can I say? It was exactly what I had been looking for. The cottage was very well planned and equipped and the vase of flowers and milk in the fridge were a really nice, welcoming touch. It was great. We have looked at many self catering cottages over the years and have not actually been tempted to stay in many but when asked to review Hill cottage we thought we would like to spend some time on the West coast, so decided to spend a few days "working holiday" at Hill cottage. We were so glad we did, the stunning scenery and carpets of wild flowers everywhere we felt privileged to witness this. We live on the shores of Loch Ness in beautiful countryside but even so we were very impressed with the location of Hill cottage, the gleaming sandy beaches and the towering cliffs on Handa Island. We visited Smoo cave and Durness with its spectacular beaches we just couldnt stop clicking away with the camera. And the icing on the cake was that whilst we were enjoying warm sunny weather sitting on beaches and watching Puffins on the cliff tops in the far north it was apparently peeing down in the south!! We have decided that we must return soon to get a few more pictures, you can see some of them on the Hill cottage Extra pictures link.